The purpose of this web page is not to teach you how to draw. I will not be going though the technique, perspective, color, line weight, software, or any of the stuff you can easily surf up. 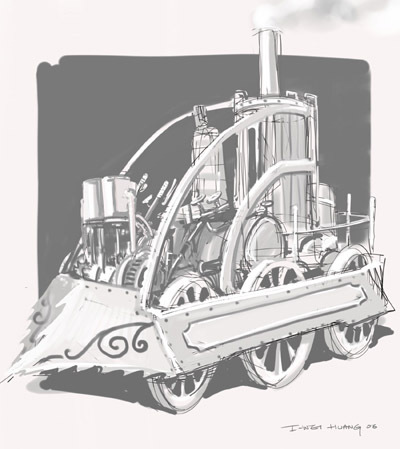 This page is to inform artists who want to draw steampunk machines but don't quite understand how steam works. 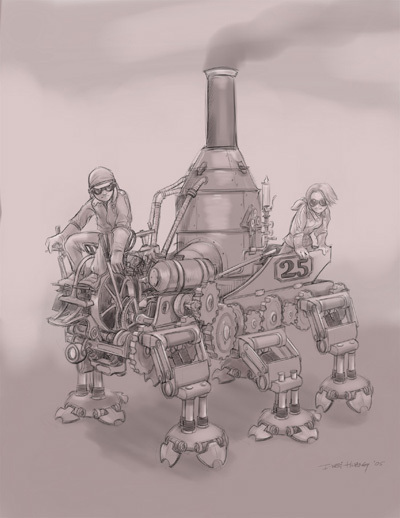 The focus is to add enough elements to your drawings, to make your steampunk machines more believable. 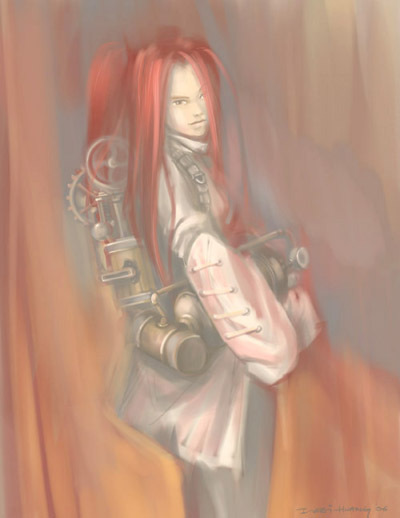 I feel that too often, steampunk designs are too fancy. 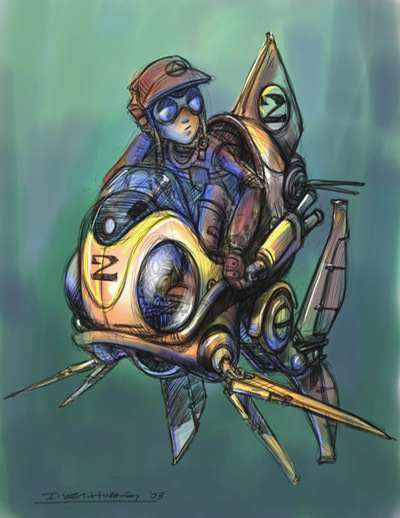 They go too cool and end up loosing the all important look & feel of old tech steampunk. 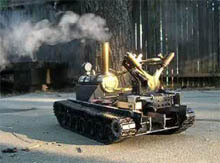 I think that it is important to state that I make real working steampunk machines / robots for a hobby. 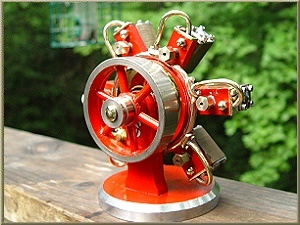 My steam site: Crabfu SteamWorks, contains lots of miniature, real working, live - steam machines. There has been overwhelming media coverage of my work, probably because I took it from the fake sci-fi movie magic, into the real world. Through experience and trial and error, I've learned not only to make something look like it would work, but actually does work. I am an animator and concept artist by trade. However, I don't think my art is really so great that it deserves a "how to". 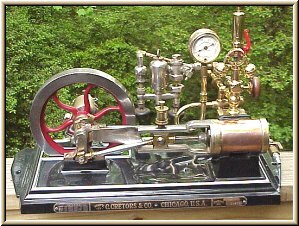 My devotion to my live steam hobby however, lends my steampunk designs a level of authenticity that often lacks in steampunk art. Therefore, this is just a quick explanation of parts, and how to draw and design a machine that "looks" convincing. Please keep in mind that these are super simple explanations of different components of live steam, and steam buffs will probably will tear these descriptions to pieces :) I feel that it is important to get the basic idea without having to go into dry and boring detail. 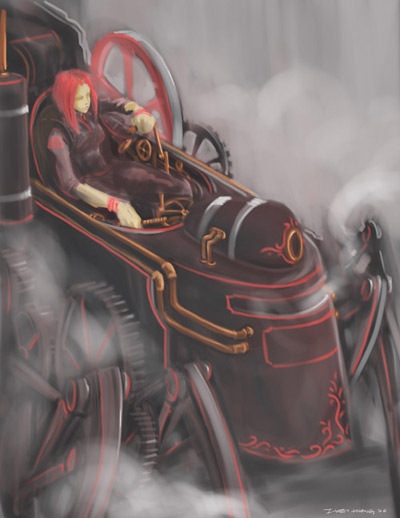 By no means am I an expert in steam engines. 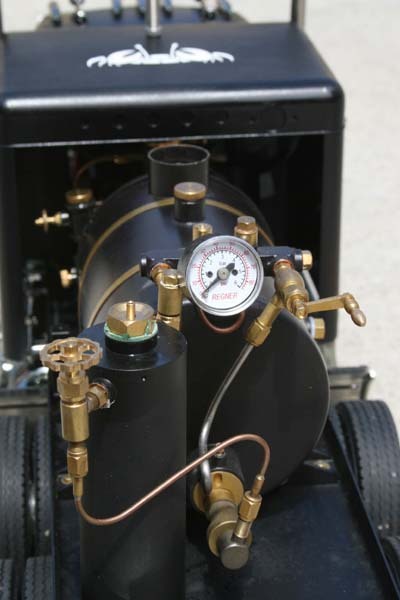 This info is taken from my personal experience working on small scale live-steam engines. Most of the examples below are found on model engines, which works off of the same basic principle as the big ones. This is also just a guide. 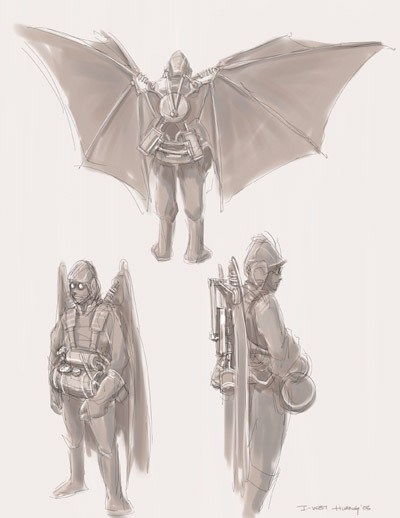 There are no set rules for concept art. You just make whatever appeals to you. In other words.... this is steam for artists, not really to educate you in details of steam power! 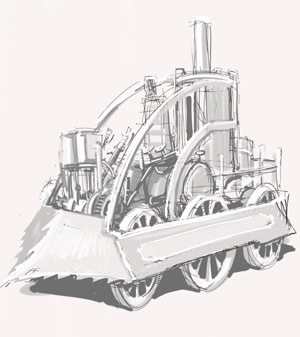 :) However, it is important to understand some fundamentals of steam power, in order to make your drawings look believable, as something that could have been built in Victorian times. 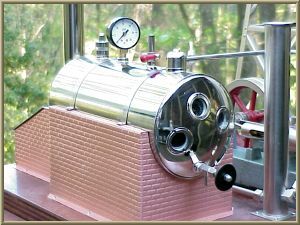 First you have to understand steam, and how it works by looking at each part of the machine. The boiler is usually cylindrical and long. The purpose of it is to boil water, pretty simple concept :) Most boilers have flues, which just means inside is a bunch of tubes for the fire to heat & boil the water fast. Sometimes they have a camel dome looking thing on top. Steam pipe should be drawn on top of the boiler, where steam comes out. However, sometimes the steam pipe comes out of the boiler, and get fed through the fire again, this is called superheater. In this case, the steam pipe can come out elsewhere visually. Anyway, to keep it simple, make pipes coming out of the top of the boiler. The "smoke stack" usually comes out of the boiler to one end. 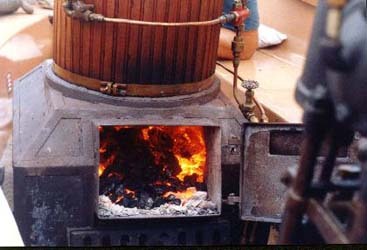 The reason for the stack is to vent the fire, as one end of the boiler is fired. Often steam exhaust from the boiler goes into the stack, the force of the steam shooting out of it, helps drawl the fire more inside the flues. Boilers usually have a stack somewhere, size and shape of the stack varies a lot.... another words, sketch whatever shape and size stack looks best, to balance out the design. Heat / Fire can be generated in a variety of ways. This usually evolves the fuel source being coal, gas, or anything that can burn really hot. With coal, you need to design an area which the coal is fed into, with a door. You also need to design an area for someone to fed the coal/wood, as well as a supply of coal / tender. With gas, you need to draw up some design of the burner mechanism, usually sticks out of the burner a bit. 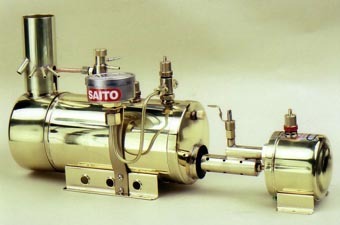 The fuel supply for gas can be a container, of any shape (although most everything is cylindrical), with pipes going into the burner, connected to the bottom of the boiler. Gas mixes with air in the process, and the amount of fire can be controlled by valves on the gas tank, as well as the amount of air is mixed for the fire. 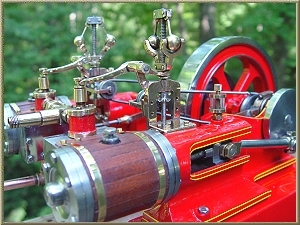 There are a variety of different types of steam engines. 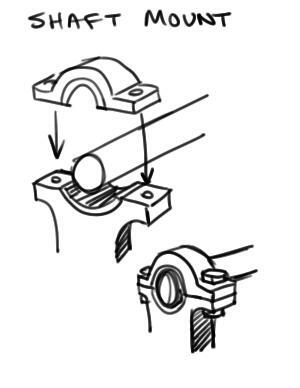 They basically are just pistons in which steam pushes, and in a variety of ways via linkages, all end up with an axle spinning in a circular motion. 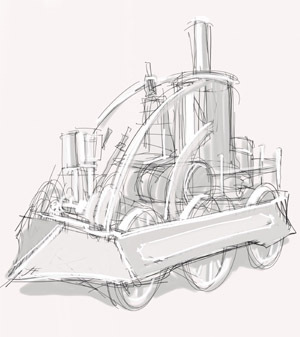 Without going into steam engines in detail, here are the basics of how to draw them. Draw a cylinder, (piston is inside and not visible). Shapes is basically a big cylinder with a small long cylinder coming out of it. Steam is piped through the cylinder to push the piston in and out. If it is double acting (pushes both in and out) then it usually contains a box like shape on the cylinder. This is for another link connected to the shaft to open and close valves to allow the steam to fed though each end of the cylinder - pushes piston out, and pushes in when it gets to the end of the travel. So to put it simply, cylinder, with a box on the side. 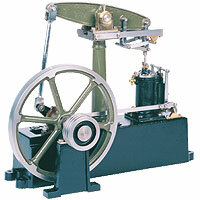 Some steam engines can be reversed. 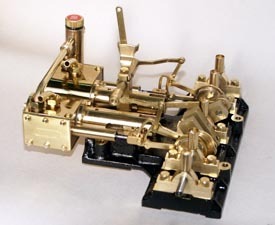 There are three ways that this can work: 1) Engine can be reserved by linkages to change how the steam is piped in by a Stephenson's linkage, which usually looks like some sort of lever, complex looking linkages, with an arc piece that guides the lever. 2) For double cylinders, a valve can reverse the direction of the steam flow, and therefore the engine runs backwards. 3) clutch driven, the engines only runs in one direction, but with the use of gears, the drive shaft can be reversed. This is usually a large heavy wheel, and it does have a purpose. The flywheel keeps the momentum going, otherwise the engine runs sporadically and can stall. Flywheels are always attached to the shaft that the pistons drive. You don't absolutely need a flywheel, but it makes the engine run a lot smoother. These things are just what it sounds like, they lubricate. They are usually attached, or very close to the engine. They can be right on the cylinder area or on the pipe going into the engine. They provide oil & lubrication for the pistons inside of the cylinder. They can be cylinder shaped container, or a manual hand pump. 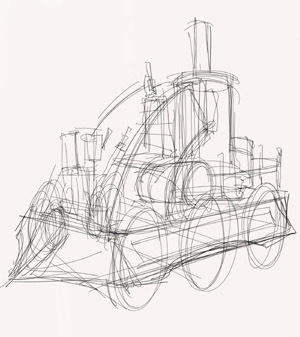 None of this is all that important in drawing steampunk machine, all you have to remember are these shapes: Cylindrical for the cylinders (duh), boxes attached to cylinders with pipe, levers & valves near the engines, and flywheel. Cool looking device.... usually 2 spinning balls powered by the main shaft of the engine. 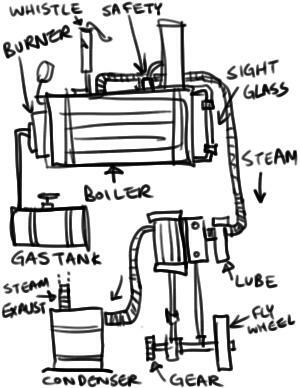 The purpose to control the amount of steam going into the engine. Usually a pulley is attached from the engine shaft to this device. When the engine spins up, it spins the governor, and the centripetal force makes the balls fly out. 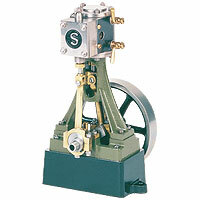 This action causes a mechanism to pull up a linkage, which restricts the amount of steam that is piped into the engine. 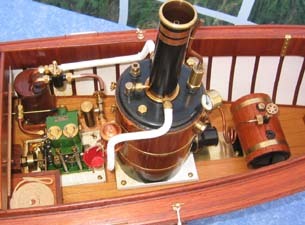 This device is must be straight up in order to function properly, and connected between the engine shaft, and the steam inlet to the engine. The condenser traps the oily steam exhaust from the engine. Engine exhaust is fed into it, allowing oily water to be trapped inside and condensed, only letting clean steam out. The steam exhaust from the condenser can then be fed into the main stack on the boiler, giving it that classic look - steam out of the main stack, however, it can be fed into any stack. This is not absolutely necessary component, but without it, things could get quite messy and covered in oil. Anyway, another easy part to draw, just another cylinder. Valves are just cool, especially when there are lots of it. Hand operated valves controls a variety of things, but basically it stops or lets steam through. This is just a safety mechanism, so when the pressure within the boiler gets too high, it will vent out steam to prevent an boiler explosion. This is attached to the boiler, up high as it needs to let steam out, not water :) It can be vented to the stack. This is just a way for you to see how much water is in the boiler. If the boiler runs dry and still firing, it will fail. Sight glass can either be a window, or a glass tube. 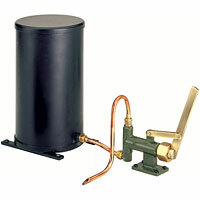 Water pumps and water tanks are used to pump water into the boiler while it is steaming. Pumps can be manual hand pumps, or connected to an engine (uses the power of the engine to pump the water). It takes water from a reservoir, and feed it into the boiler.... hopefully at the same rate that the engine is using up, maintaining water level. This is not absolutely necessary, but prolongs the duration of the run, especially if the boiler is small. Pressure gauges shows how much pressure is present. These are little analog dials, pretty easy to draw, and doesn't have much variety. 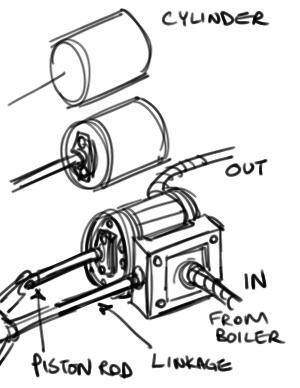 They are basically sensors for pressure within the boiler, or how much is feeding though etc. Gears, lots and lots of them. Small engines needs to be geared down quite a bit. 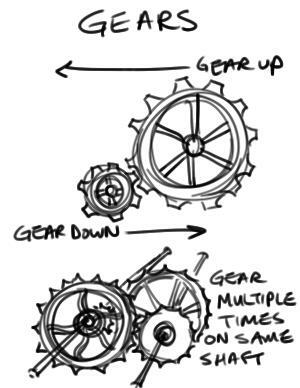 Lots of gears just looks cool anyway, but make sure that you are gearing down by drawing little gears to big gears. Old gears are usually spoked, sometimes curved spokes. High pressure can drive pistons straight to wheels, as with locomotives. 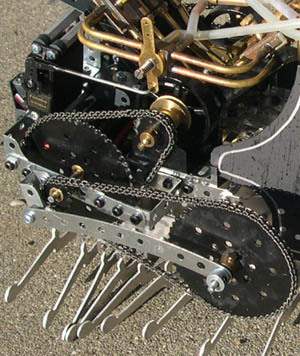 Sprockets and chains are good for driving something far from the engine. They are also more forgiving than gears, as they don't need to be exactly right on to work ( I use lots of it in my steambots). However, sprockets and chains are easier to fail, they can derail. Levers can control a lot of things. Clutches, engaging and disengaging gears, steam flow, etc. Draw lots of them for the operator.... remember, just make them look right, don't worry about what each lever might do. Steam whistles are attached to boilers, or at least some piping coming off the boiler. Steam is forced through it via some sort of a lever (often a pull chain type) and makes that classic steam whistle. The bigger it is, the deeper it sounds, but the more steam is used up. Ok so now I know each component, where do I start? Remember the basic shapes and design of the parts above (most everything is cylindrical in shape). Surf up each part above, and collect images of components, as well as old steam locomotives & vehicles for reference. Once you are familiar with the parts, you can then free sketch at will, but always use the references to keep it authentic and believable. Fist, come up with ideas. Plan out what you want it to be, a biped robot? a car? a tank? a multi legged walking machine? Don't under estimate "character". Add some personality or character to you machines, even if it is inanimate. The #1 goal should be a well designed, balanced, and eye catching machine. Worry about how it works after you have some rough sketches and shapes of something compelling, otherwise it's not worth the effort. I can't stress this point enough. Work loose first, even if you decide the finish project will be detailed and well rendered. 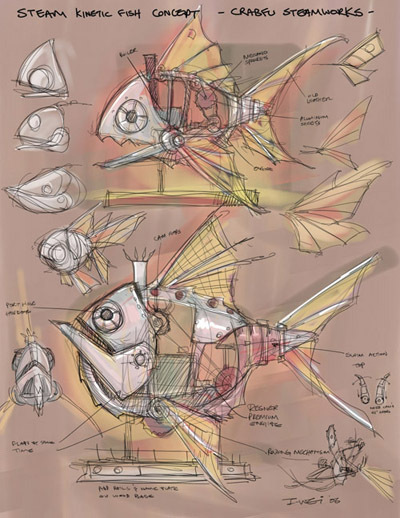 I usually prefer the loose and lazy way, just flop it down and call it good, as long as you get the feeling and idea across, you don't always need to carefully draw out each teeth of a gear - the human mind is really good at connecting and making sense of just a couple of lines. However, you can go as detail as you like, it is only a stylistic choice. Lay out the boiler first as it is the biggest, and heaviest part. Pay attention to weight and center of gravity. Boilers are filled with water, and well constructed, therefore they are very heavy. They can be vertical, horizontal, or even at an angle. Make room for some sort of a firebox or burner. Whatever chassis you have, should support the weight of something really heavy. 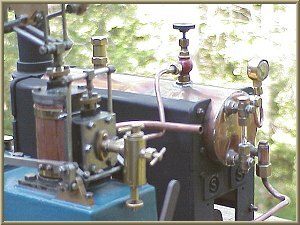 Next, draw up some cylinders.... almost everything on steampunk machines are cylindrical in shape.... from gears, condensers, fuel tank, water reservoir, shafts, axles etc.... 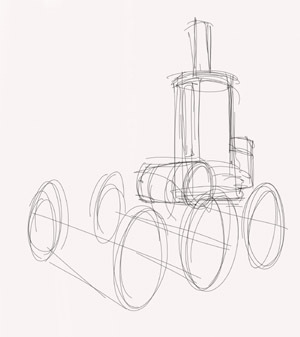 Learn how to draw cylinders in all angles, it comes in handy. 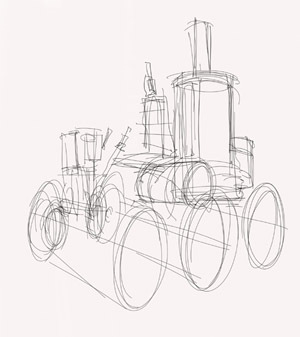 Next, draw up main axles, provide where power needs to be directed to for locomotion. Work out the locomotion.... if you get confused about how something works (as I often do) you can cover it up with body work. 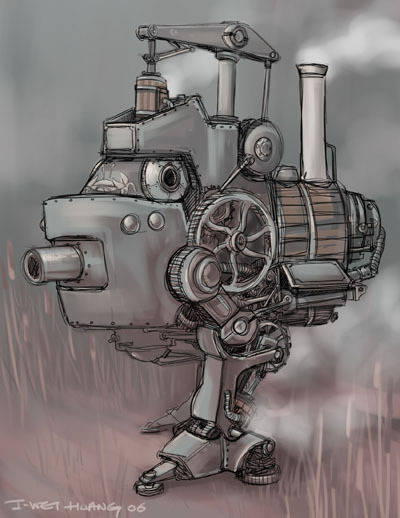 However, I think the compelling part of steampunk is in how open and simple things are, so I like showing all of the mechanisms as much as possible. Add strong shadow and shading. Add accents such as Victorian inspired scroll work, rivets etc. As well as add detail with valves, levers etc. If you decide to add color, surf up old steam trains, and steam traction engines. They often are black, but not always. Accents in brass, copper, or gold, as well as colors of maroon, dark green, or blue. 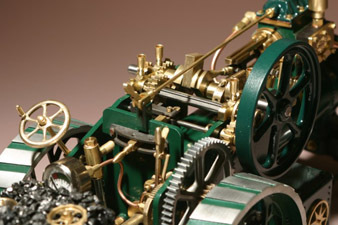 Check out Victorian scroll work, they can make a machine look very elegant and ornate. 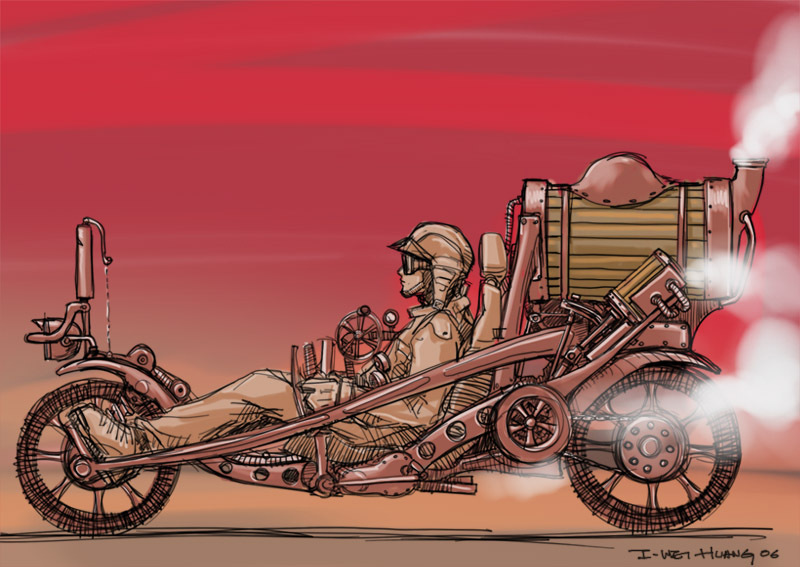 So that's it.... hope that this can be an inspiration for you to tackle on some steampunk sketches. Special thanks to cedesign for letting me steal some pictures from his impressive and beautiful collection of model steam engines.